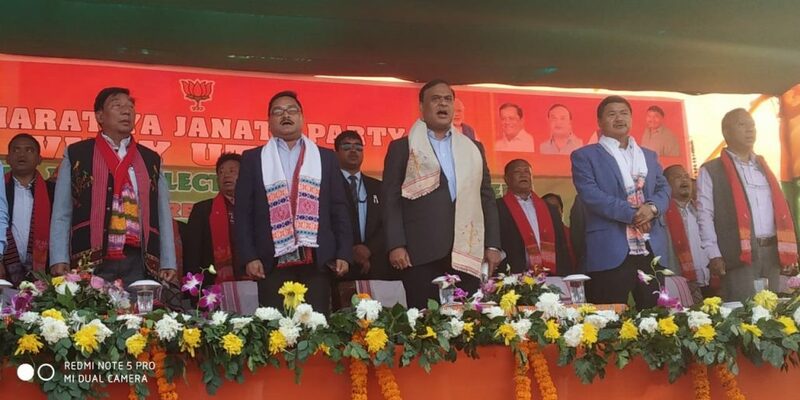 BJP leader and Assam's cabinet minister, Himanta Biswa Sarma attends Vijay Divas in Diphu on Friday. Image: Northeast Now. Senior BJP leader and Assam’s minister for Finance, Health and PWD, Dr Himanta Biswa Sarma on Friday came down heavily on critics of the Citizenship (Amendment) Bill, 2016. Addressing the Vijay Utsav held at Karbi Anglong Sports Association (KASA) Stadium at Chutianala here the minister said the protest against the Bill was mere misinformation campaign and propaganda. “We don’t want the change that has happened in Borpeta district, the Assamese cannot stay there : not the change that has happened in Dhubri, the Assamese people have to flee from there. “You have tried to give away Assam to someone. But we want that Assam should remain in our hands forever. Let it remain in the hands of the Karbis, the Dimasa, Bodo, Rabha, Sonowal, Missing, Kalita and Sarma. We are trying to secure Assam for the indigenous people. He also said that development would be carried out with a vast improvement in road communication, particularly in West Karbi Anglong. Chief Executive Member (CEM), Karbi Anglong Autonomous Council (KAAC), Tuliram Ronghang speaking at the Vijay Utsav said that it was the BJP government that had given funds for development.